As an informal education facility, CNC&F offers ongoing education programs for families, children and youth. For more detailed information on any of the programs listed below please contact Shasha McCracken. • What: The Award-winning Outdoor Classroom program with Texas Education Knowledge Standards aligned curriculum offers field trips that encourage students to self-discover the principles of science and nature through guided hands on activities here at the Cibolo Nature Center & Farm. Topics include: Lifecycles, earth science, adaptations, scientific investigation, biodiversity, habitats, birds, mammals, reptiles, insects, water cycle, water quality, team building, invertebrates, watersheds, pollution, soil, and compassing. • Who: 1st Grade-12th Grade. • When: Monday through Friday 9:30 a.m.– 12:00 p.m. September through November and February through May. • What: Farm Classroom promotes agricultural opportunities and learning experiences for children; to explain how we affect the land and how it affects us and discover how our food grows. Topics Include: Chicken Care, Plant and Soil Life, Gardening, Composting with Worms, Sustainable Living. • Who: 2nd - 5th Grades. • When: Tuesday through Thursday 9:30 a.m.– 12:00 p.m. September through November and March through May. • Cost: $6.00 per student and chaperone; teachers are free. Minimum 10 students a day; book multiple days for larger groups. • Picnic tables, water fountains, and restrooms are available, and groups can bring lunch to eat. • For more info or to schedule a field trip contact Stephanie Patillo. • What: Growing Up WILD encourages curiosity and discovery in the natural environment, introduces basic natural science concepts through hands on activities, and helps preschools explore how we affect the land over tie and discover how our food grows. Topics Include: Soil, Plants, Birds and Habitats, Insects, and Sustainable Living..
• What: Nature Boxes is an outreach program that brings science and nature based education directly to the classroom for study and exploration. Boxes are filled with fun nature and science themes that are designed to enhance current school curriculum and are aligned with the TEKS. Topics include: Rocks, watersheds, habitats, frogs, plants, soil, clouds, and many more. • Who: Grades K-5th in the Boerne Public School system. • When: Presentations can be scheduled by request throughout the school year. • Cost: Donations are always appreciated. 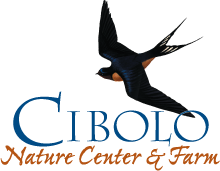 • What: Cibolo Nature School is a state licensed preschool that is based on child centered education. It is a combination of Waldorf, Emila Reggio and Montessori teaching philosophies with learning in nature and self-exploration at its core. • Who: 3-5 year olds. • When: Monday through Friday from 9a-2p starting in September and ending in June. • Who: Preschool aged children and their care-givers join a volunteer in the Visitor Center. • When: Every Tuesday throughout the year from 10:00 a.m.—11:00 a.m.
• Cost: A suggested $5.00 donation per family. • What: Nature and art themed day camp with goals to nurture an awareness and appreciation of the environment and personal expression and creativity. • Who: Camp is for children ages 5-12. • When: Week of spring break in March. Monday through Wednesday from 9 :00 a.m. – 3:00 p.m.
• Cost: $65.00 per day. $75.00 per day after March 1st. • What: Creative art based day camp that emphasizes exploring new techniques and capturing nature by encouraging personal expression and creativity. Sample Themes: Fantastic Fabric Art, Mini Monets, Primitive Prints, Spectacular Sculptures, Lavish Landscapes, Dynamic Drawing, and Clever Collages. • When: Seven weeks in June, July and August. Monday through Friday from 1:30 p.m. - 4:30 p.m.
• Cost: $190.00 per camper (weekly) early bird registration ($175) through June 1st. Scholarships are available. • What: Nature themed day camp with goals to nurture an awareness and appreciation of the environment. The camp fosters teamwork and mutual respect for others. With traditional camp activities such as crafts, songs, games, and skits, each week has a unique theme and a special guest to encourage learning and exploration of the outdoors. Sample Themes: Survivor Cibolo, Natural Magic, Fishing Fiesta, Hunger Games, Pirates of the 7 C’s, Mad Scientist, and Wet and Wild Crazy Creek Week. • Who: Camp is for children ages 5-12. Counselors in Training are 13-15. Junior Counselors are 16 & 17. Unit Managers are 18 and up. As a state licensed camp, all counselors are certified in first aid and child safety. Nature Camp reaches over 500 children a year. • When: Eight weeks in June, July and August. Monday through Friday from 9:00 a.m. - 1:30 p.m.
• Cost: $175.00 per camper (weekly) early bird registration ($160) through June 1st. Scholarships are available. • What: Parents bring their young explorer and stay for fun and adventure. Activities are inside and outside and help children discover nature using their 5 senses. They’ll listen to stories, plant seeds, hunt for bugs, sing, dance, and create art to take home. • Who: Preschoolers ages 2-4 and their caregivers. • When: 4 weeks in June and July. Monday through Wednesday from 9:00 a.m. – 12:00 p.m.
• What: Scout badge workshops are customized activities to work on specific badge objectives. • Who: Boy and Girl Scouts of all ages. • When: Scheduled by appointment. • Cost: $20.00 per scout. • What: Our Birthday Party provides rental of the pavilion or back porch of the Nature Center for 2 hours and a program host that will facilitate an educational activity and craft for children for an hour. Party themes are: Reptiles, Insects, Skulls and Tracks, and Nature Scavenger Hunt. • Cost: $150.00 for 2 hours and 15 children. • What: Community wide event to celebrate spring, beginnings, and growth! Enjoy children's activities, adult workshops, live music, local food and artisans, and much more. Come discover what's growing! • Who: Open to all in the community. • Cost: $5.00 per person/$10 per family. • What: Community wide event to celebrate fall and harvest season. Participants enjoy painting pumpkins, finding their way through a hay bale maze, bobbing for apples, making fall crafts, and playing carnival games. * What: Science in Nature offers families with children of all ages a day to play and learn about nature through science. This community event kicks off the new school year in September with a celebration of learning in the natural world. It offers a variety of activities for children and families that encourage inquiry and exploration. Sample Activities: Bird beak buffet, insects, mammals, butterflies, Native American tools, slime, bats, & seeds. * Who: Volunteer scientists and nature educators lead outdoor activities appropriate for children of all ages. * Cost: Donations are always appreciated.